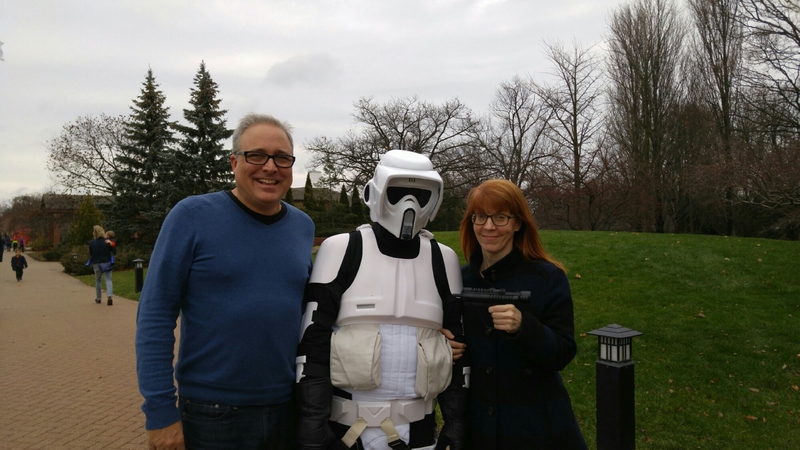 Especially since I helped capture a stormtrooper last weekend outside a museum near Chicago. Typical Sunday morning kinda stuff, you know how it is. 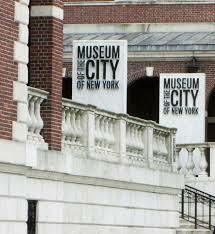 I have lived in New York City going on nine years now, but today was my first trip to the Museum of the City of New York. It’s located at Fifth Avenue and 103rd Street, just a quick jog across Central Park from my Upper West Side neighborhood. Props to Groupon for giving me the push I needed to pay a visit. Two for one admission — need I say more? The space is compact, clean and modern, with exhibits of a number and size that make it easy to see and do everything in a morning or afternoon. 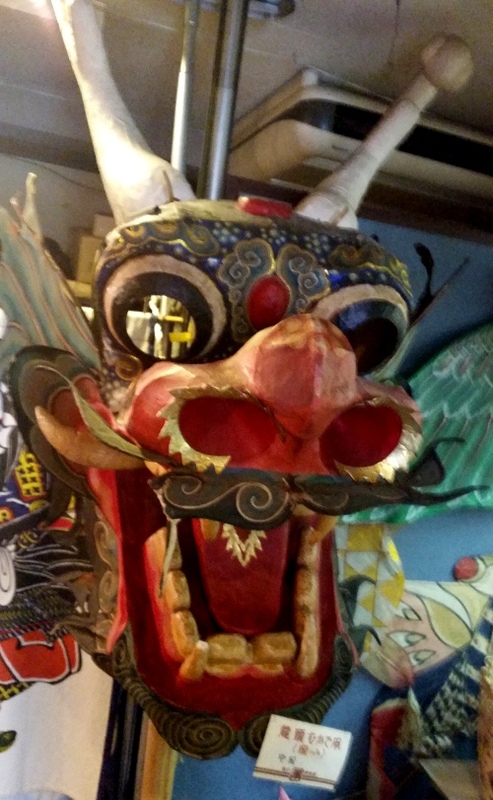 There’s also a nice variety — photography, film, costumes, paintings, advertising, multi-media, miniatures — so everyone in your group will find something to hold their interest. My favorite on this cold damp day? Everything is Design: The Work of Paul Rand, an exhibit showcasing the six-decade career of the iconic graphic designer (and Brooklyn native). 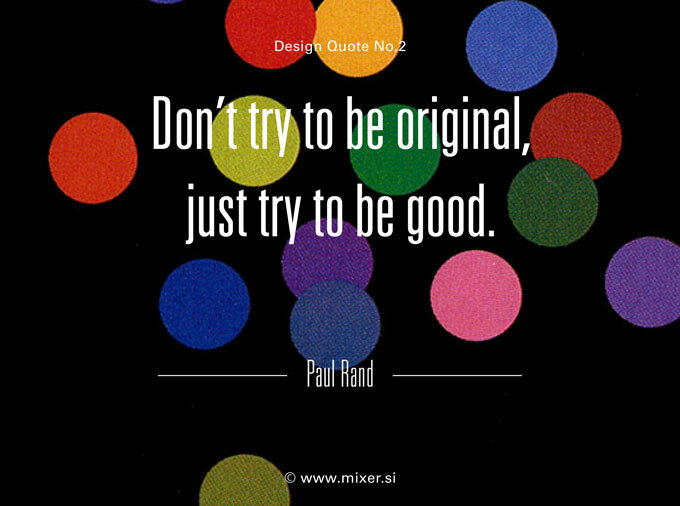 While Rand is a legend in the design community, you may find yourself wondering who he is. A quick look at a few of the logos he designed will make you realize you gaze upon his handiwork nearly everyday. Rad designed children’s books (with his wife Ann) and other book jackets as well, and wrote two visionary books on design. He also taught at the Pratt Institute and Yale before his death in 1996. A quick Google image search will not only give you an idea of the breadth of Rand’s art and impact on current design, but is a really fun way to entertain yourself on a rainy day. My flight home today to New York wasn’t until afternoon, so I decided to squeeze in some more sightseeing before check-out. 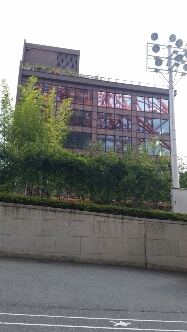 My feet voted against the idea, so I took a taxi to the Tokyo Tower which, like my hotel, is located in the Roppingi district. It looks like an orangey-red Eiffel Tower, so I imagined it also occupied a large, grassy expanse. 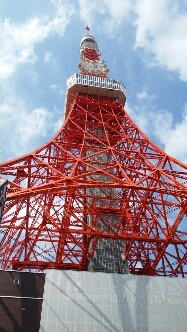 But this is Tokyo; the tower (which is taller than Eiffel) is sitting directly on the street. You can see it here reflected in the building across the street. There are two observation levels. 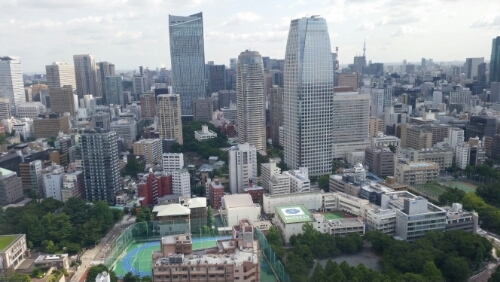 The first offers beautiful views of Tokyo. After I came back down to Earth, I grabbed lunch at Bubby’s, the Tokyo location of a New York restaurant in Tribeca and Brooklyn. I discovered it quite by accident a few blocks from my hotel and had to check it out. 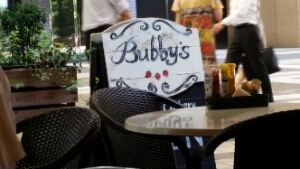 Bubby’s is famous for their breakfast, burgers and homemade pie. I had banana-walnut pancakes for lunch — hey, I was on vacation — and they were good. It was the perfect transitional meal before I headed toward home. 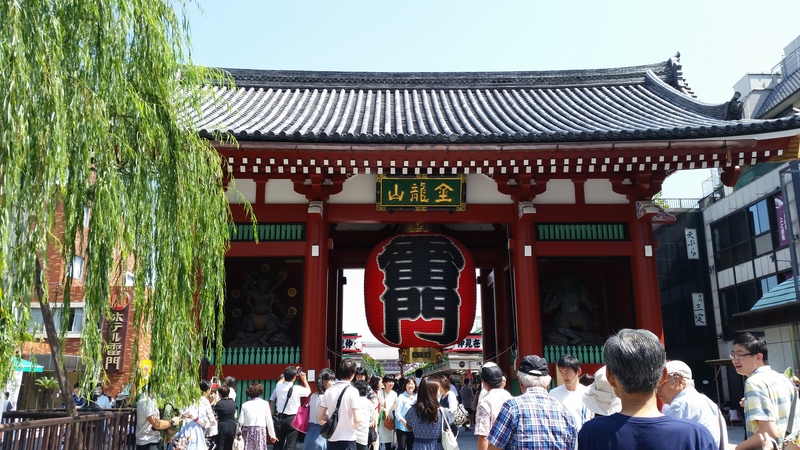 After eating a hearty Japanese breakfast of green salad, rice and hot tea, I took the subway to the Asakusa district, which is home to Tokyo’s oldest attraction, the Senso-ji temple. (I picked a good day to brave the trains. Foot traffic was fairly light, and I found the signage and announcements clear and easy to understand. 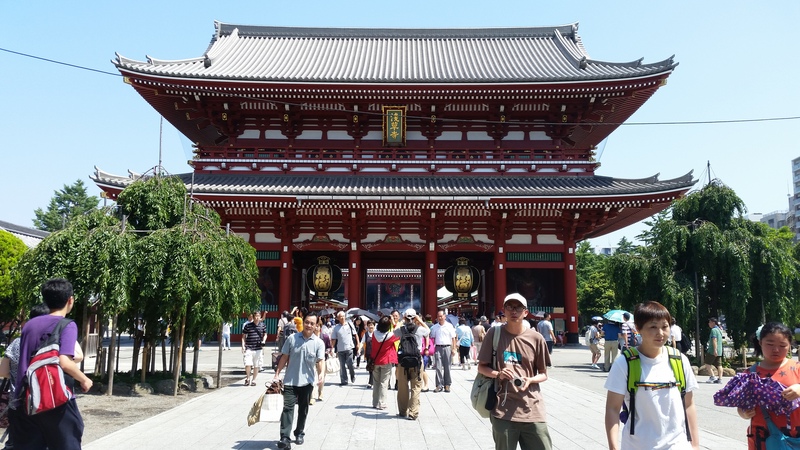 The temple entrance is guarded by the gods of wind and thunder at the Kaminarimon Gate. They didn’t seem that ferocious to me, and quite open to a selfie or two. The main hall is a five-story pagoda. There’s a incense cauldron in front; people were rubbing the incense on themselves for good luck or simply waving the smoke toward themselves. Across the river from the temple is the Asahi Beer Hall. 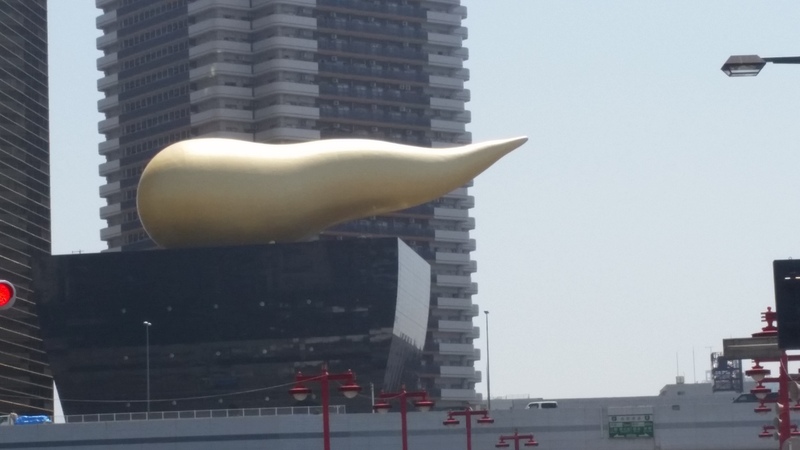 It’s golden plume, which is supposed to be beer foam, is a Tokyo landmark (although the locals call it the ‘golden turd’). I love that. I was excited to visit the Taiko Drum Museum, but it wasn’t at the map location, and business owners nearby hadn’t heard of it. Seems like they would have heard a drum…nevermind. 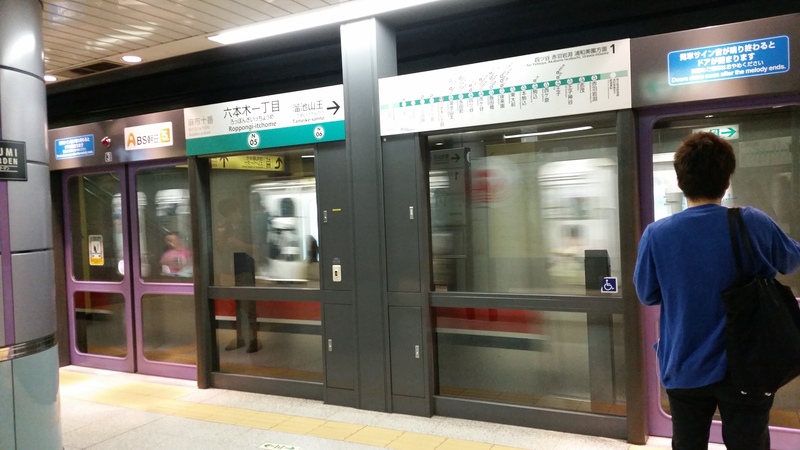 I jumped back on the subway and took the Ginza Line to the Shibuya district. 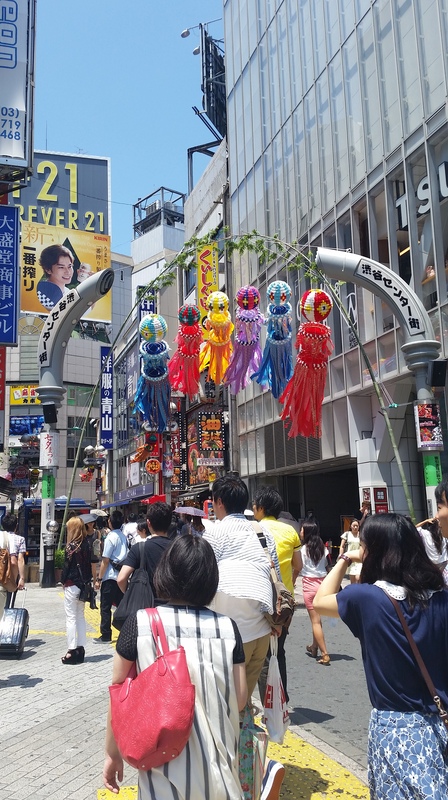 Shibuya Crossing is as new as Asakusa is old. There are video screens and noise and thousands of people seemingly moving at once, but the chaos has a kind of order to it. 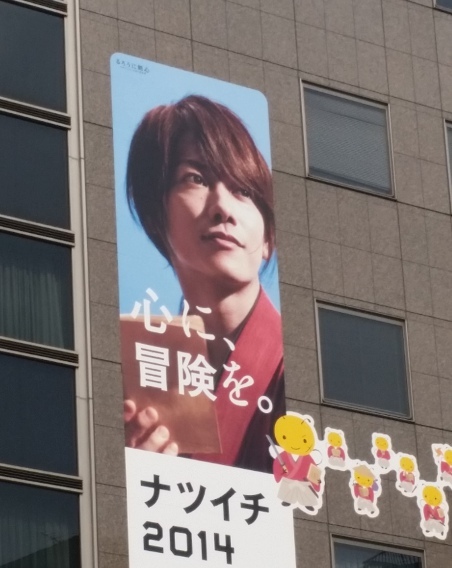 And remember the good-looking guy I saw yesterday plastered on buildings? 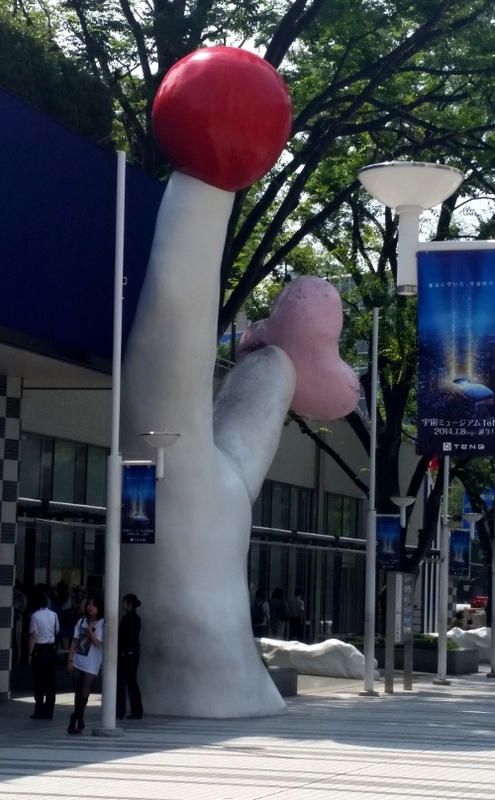 He was at Shibuya, too. Gotta figure out who he is. 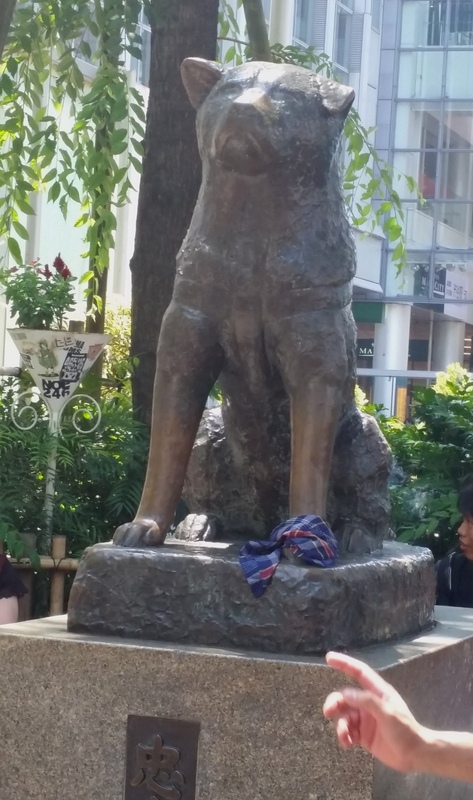 Hachiko the dog was there, too — well, the statute that is. His master died in 1925, but the dog continued to go to the station to meet him until his own death some ten years later. The pup was very popular; it was hard to get a shot. 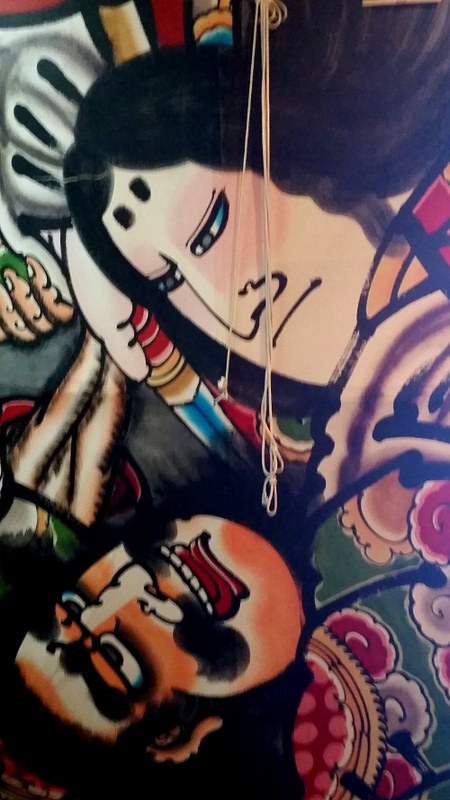 I don’t know whose hand that is, but he is forever immortalized here on the Egg. After a stop back at the hotel for the standard wash, clothing change and nap — the heat really takes it out of you — I ended the day at the Roppingi Hills, a large shopping / arts / entertainment complex in the district where I am currently staying. 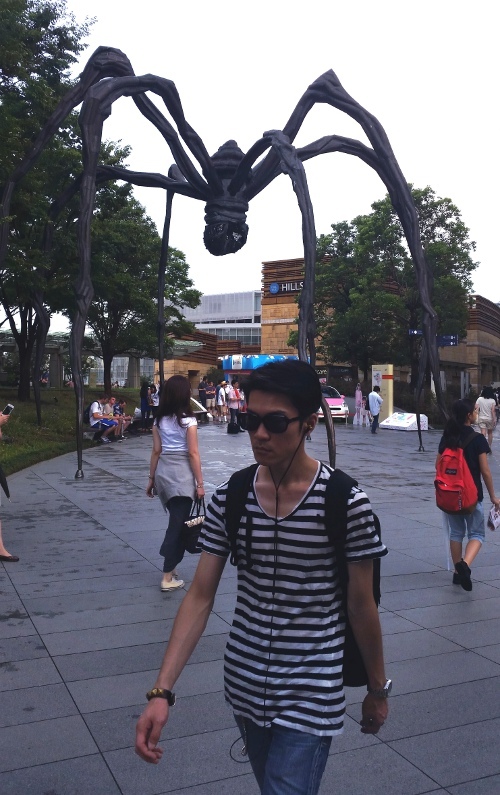 I visited the Mori Art Museum, an extraordinary contemporary art museum (with an even better store). I’m told the observatory has amazing city views, but it was closed because of the weather. I found that odd…until it started storming. It was slightly less sticky afterwards, so it was worth it. I’m resting my feet and back until tomorrow. Only one more morning of adventure and then the flight home to NYC! I was free to play tourist today, so I began in the Jimbocho district where my conference hotel was centered. 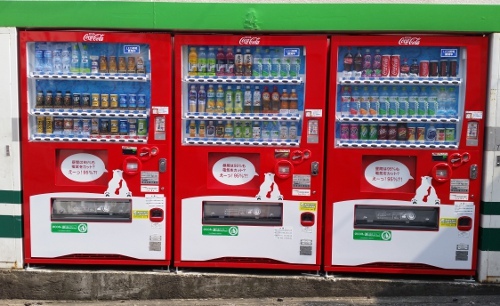 My first stop was within walking distance, so I grabbed a water from one of the vending machines that occupy every corner of Tokyo. I don’t know who this guy is, but he must be a pretty big deal. His face was plastered on every other building along my walk. He’s cute. Love the bangs, too. Most tourists visit Japan in spring or fall; now I understand why. I didn’t have a long walk, but even in the early morning hours, temperatures were in the 90’s with staggering humidity. I quickly adopted the Japanese practice of walking with an umbrella. It really helps. 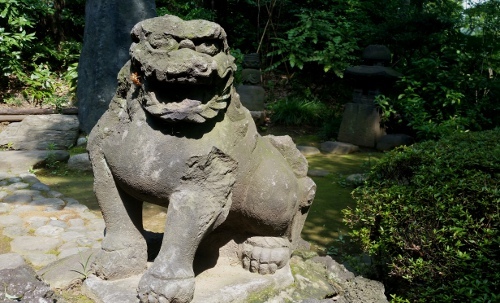 My first stop was the Koishikawa Korakuen, a 70,000 square meter formal garden. This guy was the first to greet me along the stone pathways. It was ten degrees cooler inside the garden, so I was glad I took my guidebook’s recommendation to come early in the day, before the noise from nearby Tokyo Dome (baseball and amusement park) could be heard. You can see the Dome in the background of this shot of a lily pond. When I first came upon it, I thought a spaceship was hovering nearby. It was very surreal. 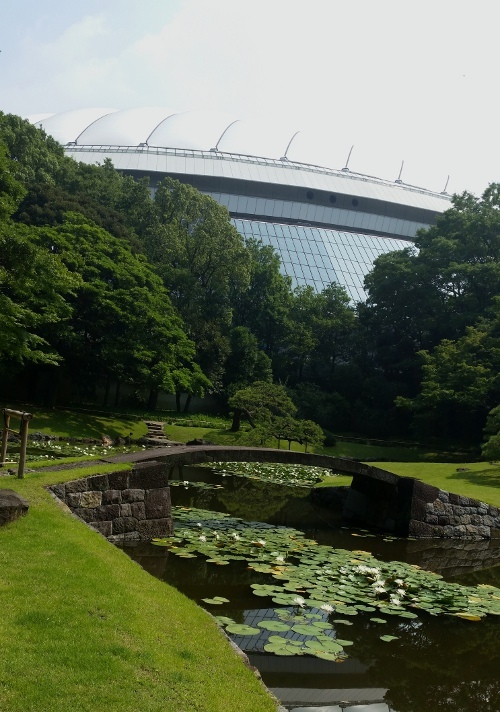 After I left the garden, I decided to take a peek at the Tokyo Dome grounds. There was an 11 a.m. baseball game, and fans were already streaming into the grounds. I got a better look at the roller coaster, but was particularly fascinated by a sculpture near the entrance to the park. I couldn’t find a placard with an explanation for the sculpture. So, let’s take the highroad and say it is some kind of flower. It’s hard to un-see it, I know that. On my walk back, I checked out some of the used bookstores that line the streets of Jimbocho, which is considered the center of book publishing in Tokyo. Then I stopped by the hotel to make a complete clothing change — totally necessary — before heading to the Marunouchi District. 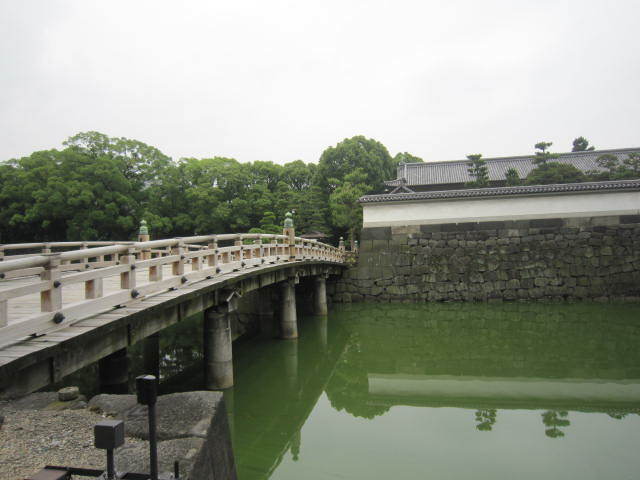 The Imperial Palace was just a couple of blocks from my hotel, so I walked along it’s enormous moat — with many brave people jogging in the heat — then headed into the business district for lunch. 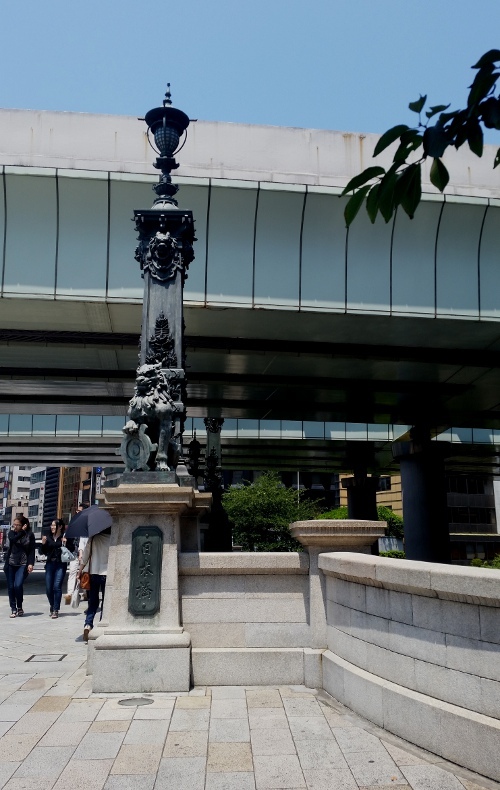 Next on my list was the Nihombashi Bridge, which is the geographic center of the city. Based on everything I had seen so far, I was expecting the bridge to be on the same scale. But the ancient passageway is small and rather understated; I don’t know that I would have noticed it unless I was looking for it. The expressway overhead plays a big part in that. It casts a long shadow. 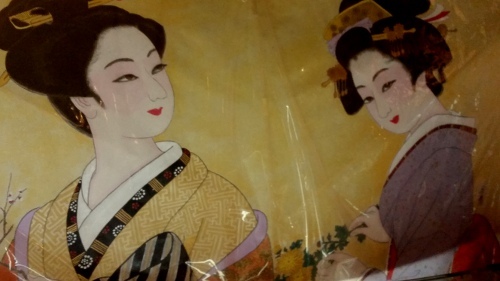 Even smaller but oh so colorful was the Kite Museum down the street, devoted to the Edo-dako style kite. I entered here out of curiosity, but stayed a good long time (and not because it was air-conditioned). The kites were really beautiful art pieces, displayed as kites, framed under glass, and covering the walls and ceilings. I moved to a hotel in the Roppingi district in the late afternoon and treated myself to an unexpected but thoroughly enjoyable four-hour nap! 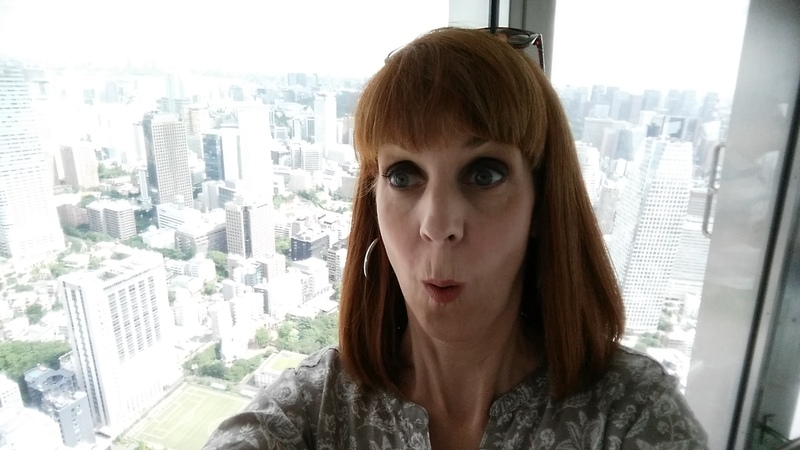 I am refreshed and ready for tomorrow’s adventures in Tokyo. 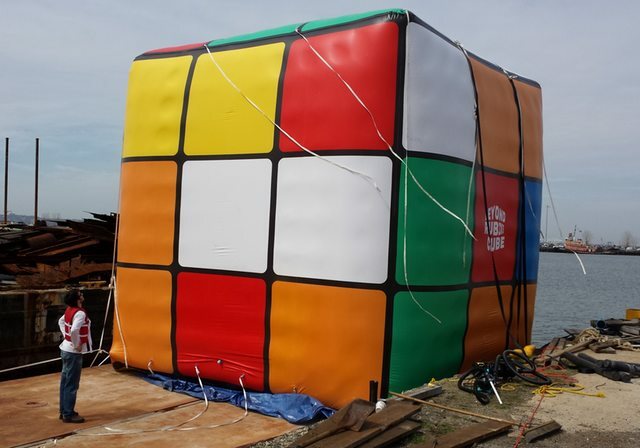 This morning many New Yorkers were puzzled by the presence of a particularly prodigious Rubik’s Cube, floating along the Hudson River on a barge. The colossal cube was created by the Liberty Science Center in neighboring Jersey City as part of their weekend-long celebration of the popular game’s 40th birthday. What other games from our childhood deserve to be made ginormous and set afloat on a nearby body of water? Easy Bake Ovens? Troll Dolls? Pet Rocks? Cast your vote in the comments! 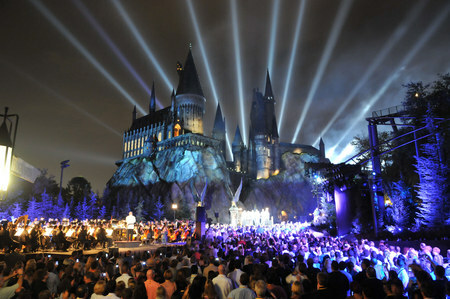 My sister and I are planning a trip to the Wizarding World of Harry Potter later this year. Two childless women. Headed to an amusement park. I can’t wait. Luckily, Universal Orlando welcomes people without children to their properties. Sure, the Harry Potter books were originally written for a young adult audience, but the franchise has an appeal that defies age. I’m glad they recognize that. Legoland is not quite as open-minded. If you don’t have a child, you are guilty until proven innocent. 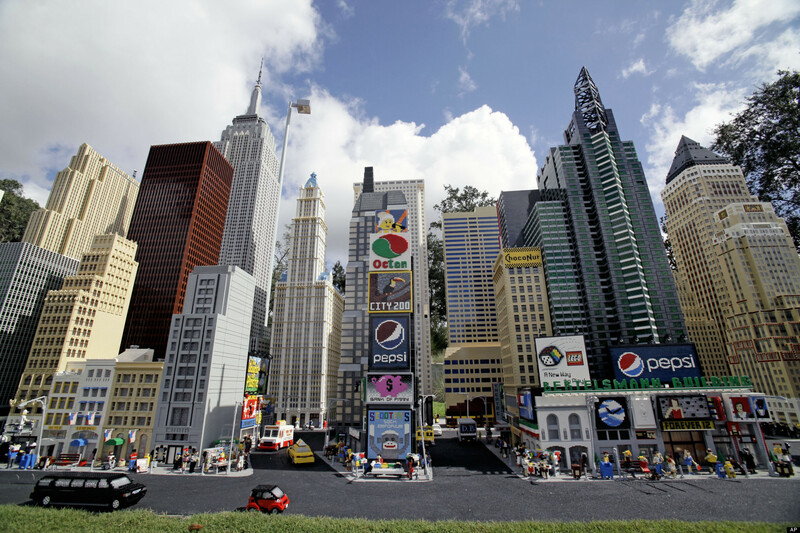 Is it so hard to believe that someone would want to visit Legoland to be inspired by the design?